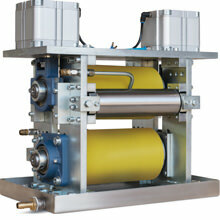 The ROTOL squeeze-on roller system is a lubricator developed exclusively in house by Eckardt. This is an exceptionally rugged, long- lasting lubricating machine designed to apply lubricant in precisely defined film thicknesses over an entire surface. 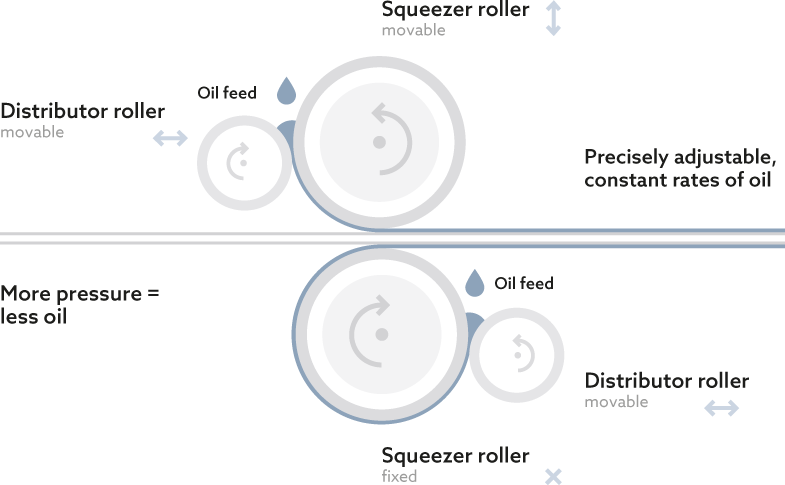 Thanks to the ROTOL calender rollers our squeeze-on lubricators achieve very high pressures. Thinnest, homogeneous film thicknesses possible. Fleece rollers remove cleaning liquid, for example, from cleaned metal parts during the forming process of carbody parts. Following close consideration we came to the conclusion that this principle of “squeezing off” could be reversed and used to apply lubricants. That is the basis for the ROTOL squeeze-on lubricator. 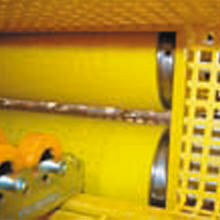 The fluid medium is fed between the distributor roller and the fleece rollers. (the amount of oil fed into the system is not decisive). The medium spreads across the entire width of the roller. The fluid is absorbed by the open pores of the fleece roller. 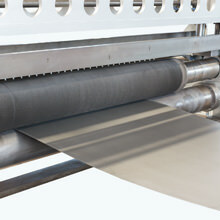 The line pressure acting on the pores increases constantly as the roller rotates on the surface of the sheet metal; the roller begins to flatten. The fluid forms a wedge between the fleece and the surface of the sheet metal. Depending on the pressure the porosity of the fleece roller reaches practically zero. The media is squeezed onto the surface absolutely homogeneously. The film thickness decreases as the contact pressure applied by the roller is increased. The line pressure acting on the roller (pores) drops again, the pores open and soak back up a certain residual amount of the fluid like a sponge. The ROTOL squeeze-on lubricator achieves a very long service life, because the material is largely resistant to decomposition due to hydrolysis. You can also send narrow materials through wide rollers, because the roller material is highly resistant to “indentation”. Consequently, just one machine is all that is required for all sheet metal / coil widths. It is possible to use all fluid lubricants through to grease, depending on their viscosity. The medium spreads evenly across the entire width of the roller so that it is possible to guarantee it is applied homogeneously at all times. 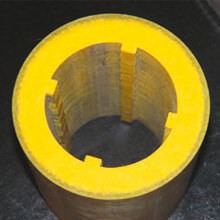 The surface of the roller is only absorbent to a certain degree; in other words, the applied material does not penetrate deeper into the roller where it could remain as residue. Consequently, the system runs immediately “homogeneously” when the lubricant is changed. The gap between the ROTOL calender rollers determines the thickness of the lubricant film. The gap is set by means of a digital display. The settings are allocated a retrievable numerical value. That means it is always possible to reproduce the film thickness precisely - by design. You wish to learn more about the technical characteristics and fields of applications of our squeeze-on lubricators?